Lightly grease and flour a 9" x 13" cake pan. Mix the cake mix according to package directions. Bake for about 20 minutes until a toothpick inserted into the center of the cake comes out with slightly moist cake crumbs on it. (do not overtake). Let cake cool completely. In a small bowl, mix the jello and the boiling water. Whisk the mixture until the jello is totally dissolved. Add the cold water and whisk for about 30 seconds. 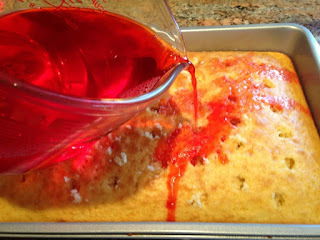 Pour the jello mixture over the completely cooled cake, distributing the jello mixture evenly over the top of the cake. Refrigerate the cake for about three hours until the jello has had time to set up. Spread the cool whip over the top of the cake and add the fruit. Any flavor jello can be used in the cake. Any fruit can be used to decorate the cake. Fresh homemade whipped cream can also be used instead of the cool whip.